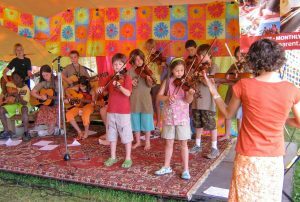 Natalya teaches fiddle lessons to students ages six and up in Asheville, North Carolina. While using classical technique as a base, she uses her expertise in a variety of fiddle styles to open a vast world of music to her students. Her teaching philosophy centers around a balance of technique, musicality, and fun. Natalya emphasizes a student-driven curriculum and primarily teaches by ear, as well as note-reading, if desired by the student. She currently teaches at Warren Wilson College and the Academy for the Arts.